When visiting Mexico City, there is an abundance of day trips to choose from when planning your activities. A fantastic destination to explore can be found just outside the city. This is where the historic canals of Xochimilco (so-chee-mil-co) are located. In Nahuatl, the language of the Aztecs, Xochimilco means "garden of flowers". Enjoyed by foreigners and nationals alike, this magical location dates back several centuries. Miles of canals dot the landscape in Xochimilco, enchanting the senses with their natural beauty. Flat-bottomed boats called trajineras travel these waters, as they have for hundreds of years. Produce and flowers grow in abundance in this exotic atmosphere. What makes Xochimilco so fascinating is its embodiment of traditional Mexican culture. These canals and gardens represent a living example of an ingenious agricultural practice that was invented long ago. The Xochimilca people settled in the Valley of Mexico between the eighth and tenth centuries. One of the key challenges for these early inhabitants were the vast amount of wetlands that the area possessed. Traditional farming methods were not conducive in this setting. To surmount the obstacles this water-filled environment presented, the Xochimilca came up with a creative solution. 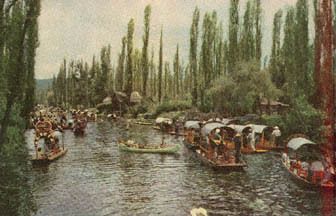 Using available resources, these settlers built chinampas (floating gardens) on the surface waters of Lake Xochimilco. Using cane structures, mud was placed inside these containers and were anchored in position by trees lining the shore. Fertilizer was culled from the floor of the lake bed which was rich in aquatic mulch. Flowers, fruits and vegetables grew abundantly using this successful farming method. The Xochimilca people who established these chinampas were ultimately conquered by the Aztecs, who in turn utilized these floating gardens to feed their growing empire. During its height, the chinampa system extended over 22,000 acres of wetlands and provided food for tens of thousands of people. The canals were built to navigate the chinampas and to provide a transportation corridor which brought produce to the Aztec Empire. Today, the existing canals of Xochimilco represent only a fraction of their former acreage. A portion of the canals have been set aside, dedicated to an ecological park, the Parque Natural Xochimilco. This area of Mexico represents the only remaining habitat for the Axolotl salamander, a critically endangered species. Also, a great number of birds make their home here, including herons, egrets and ducks, to name just a few. In actuality, Xochimilco is home to over 150 native birds with approximately 70 species visiting the canals during the winter season. Visiting Xochimilco provides the traveler the opportunity to view a part of Mexico's historic past. On Saturdays a popular produce market attracts large crowds. In the 1920's when the area was first starting to attract tourists, Xochimilco was affectionately called "the Venice of Mexico". In 1987 it was designated a World Heritage site by UNESCO. Spending time here is popular with both visitors and residents alike. The brightly colored trajineras are available to rent on a per hour basis. The canals of Xochimilco provide a festival-like atmosphere with the sound of mariachi bands filling the air. Smaller canoes with vendors sell everything from corn-on-the-cob to blankets to chilled beverages. This travel destination is a wonderful spot to enjoy recreation, fun and great scenery.